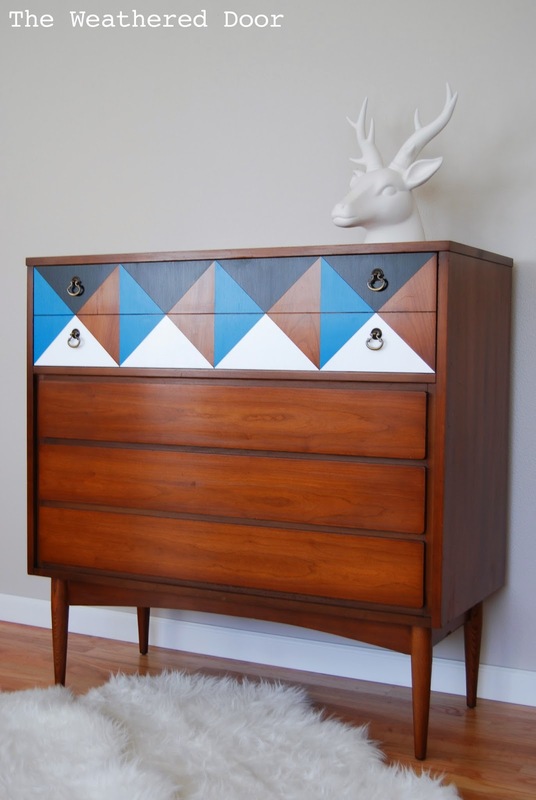 I love geometric designs and mid century furniture. 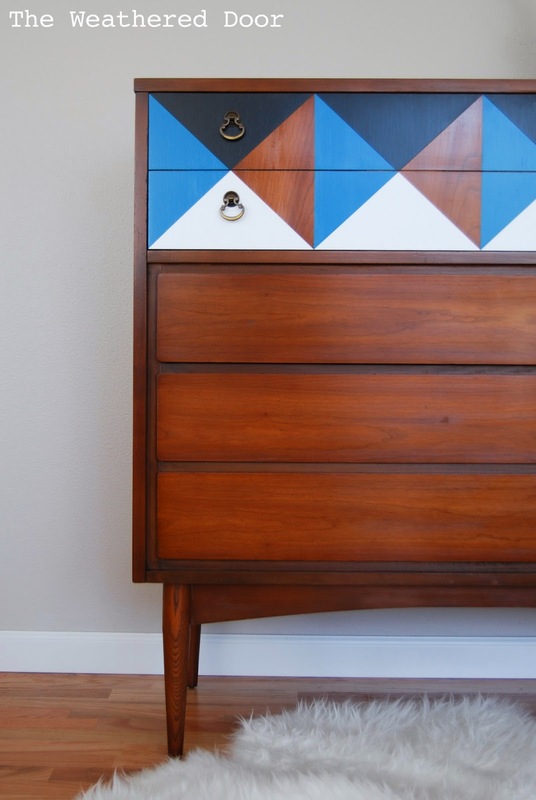 Last year I painted a geometric nightstand and had to bring the design back for this Dixie mid century dresser. When I bought it, the finish was not in great shape. It had a lot of scratches, areas where the stain was rubbed off, dings, and just needed some love. I first painted the design on the drawer using regular Behr white paint and primer in one (straight off the shelf), Sherwin Williams Loch Blue, and General Finishes Lamp Black. It definitely takes time and patience, but it pays off! I wanted to change those pulls out since I don’t think they fit the piece, but I don’t know what to replace them with. For the rest of the dresser I sanded it with 220 grit sandpaper to remove some of the sheen and get any gunk and years of build up off. After cleaning it off I gave it one coat of Rustoleum’s Ultimate stain in Dark Walnut. I applied the stain with a staining pad then wiped it off. It just enhances the tones of the wood and makes all those surface imperfections disappear. Once it cured, I finished off the whole entire piece with General Finishes High Performance Satin Poly. Here’s a video tutorial of how to refresh wood without stripping using Gel Stain. I actually like the pulls. It's a nice juxtaposition of modern vs vintage. I love this! 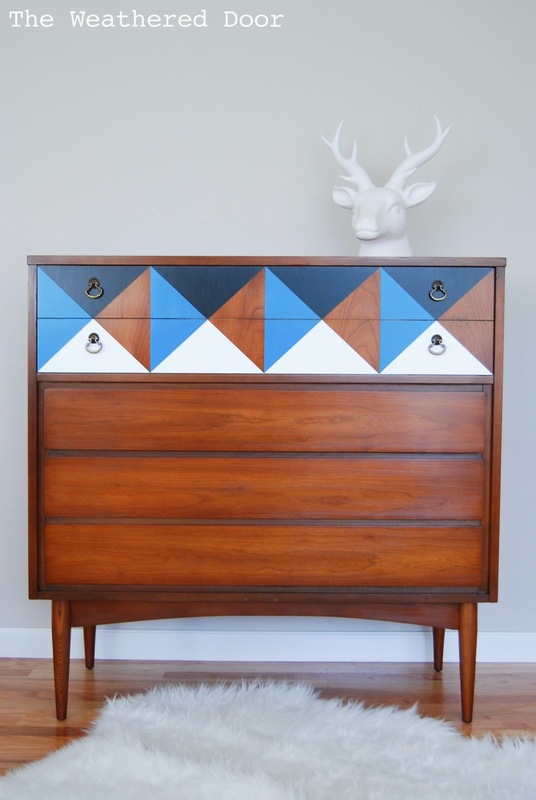 Sometimes painting takes away the beauty of a MCM piece but you have made this GORGEOUS! BRAVO! This is the most amazing design I've seen in a long time. I absolutely LOVE it. Excellent job! The stain on the wood is amazing. Love the geometric design. Fantastic!!! You rock! This is seriously amazing, Reeves! You're so creative! Nice and crisp looking. Perfect geometric shapes. I would love for you to share on my Chic By You Link Party @ http://chicbytab.blogspot.ca/2014/04/chic-by-you-wednesday-link-party-7.html. Hope to see you there! This is really nice. The wood and coordinating colors work so well together. You outdid yourself with this really gorgeous piece. I totally LOVE it! Beautiful piece! The design really complements the aesthetic of the furniture! Beautiful dresser, love the color/stain combination. This turned out beautifully. What a clever design idea. 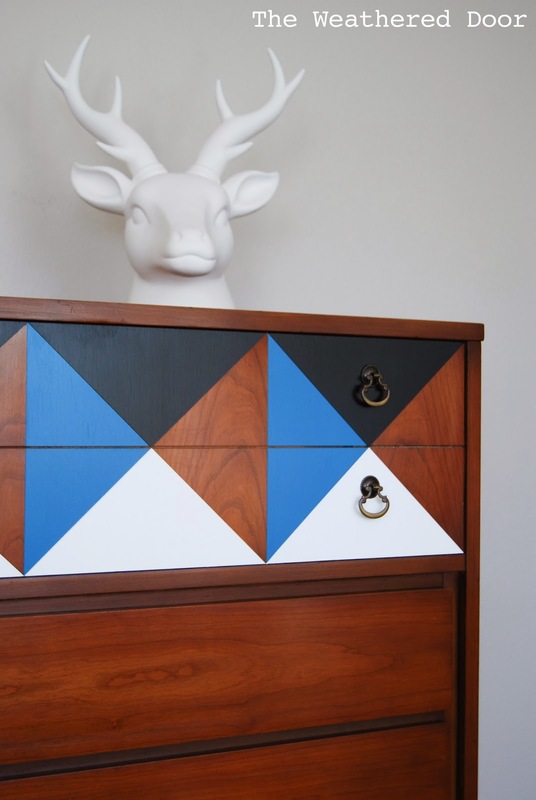 OMG This is the most beautiful furniture makeover I’ve ever seen. And I’ve seen quite a lit. I just bought a nice Polish mid century dresser and I’m gathering some inspiration before I start chainging it. Thought I might even write a blog post showing the best pieces of that kind of furniture to my readers here in Poland. Would you mind if I used your dressers pics too (with all the credits and links etc.)? Thank you! 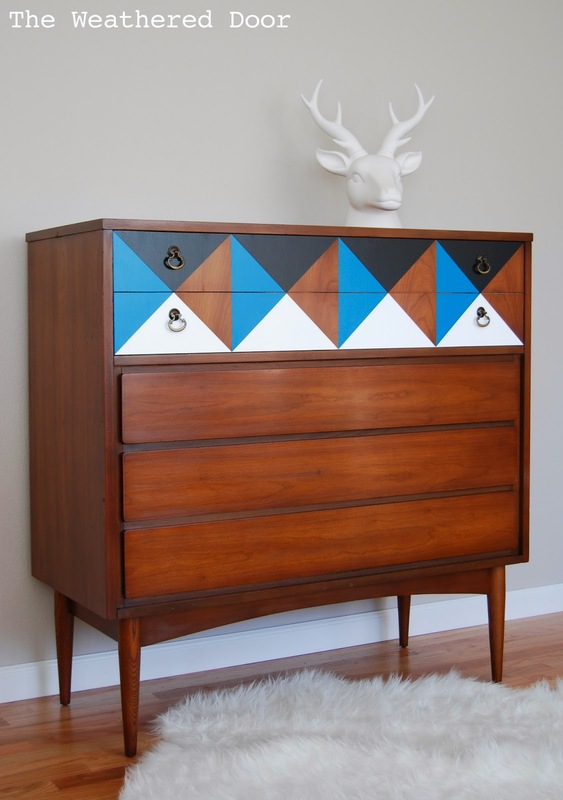 I love geometric designs on modern pieces. I just measured and taped. There is another post I wrote about how to get perfectly clean lines when painting. Search it on the blog if you want more information on that part of the process.